Iris van Herpen presented her ten piece collection for Spring/Summer Collection at Amsterdam International Fashion Week 2011. Water was her inspiration, splash of water showed on screen on naked women, appearing one essential element on her show- water! Titled “Crystallization” its technically and chemically induced process of water turning into crystal…say its frozen on mid-air!!!…amazing? unbelievable? Iris translated that process by giving water a determined form. 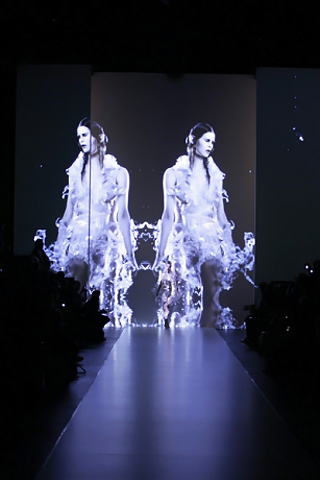 Some outfits looked like someone had thrown a bucket of water over a model and time had frozen that water into an outfit. Exactly that opposition between fluid and hard materials was the starting point of the collection. There was also a strong contradiction between wearable and non-wearable items. 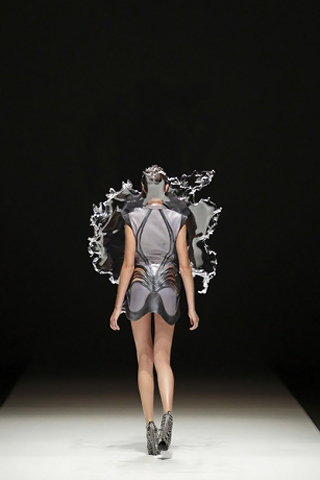 Van Herpen was fascinated by the fact that secret lines are hidden in fully transparent and fluid materials. At the moment this material freezes, when the crystal arises this comes to life. It’s then that the symmetry and structure underneath become visible. Apart from the frozen water items Iris showed several strong handmade designs. Every detail of those outfits was perfection and must have taken hours to make. Yet those are the designs which define Iris as an artist. The collection , though few , represented worthwhile pieces, Iris Van Herpes is one of the best designers Amsterdam could offer.